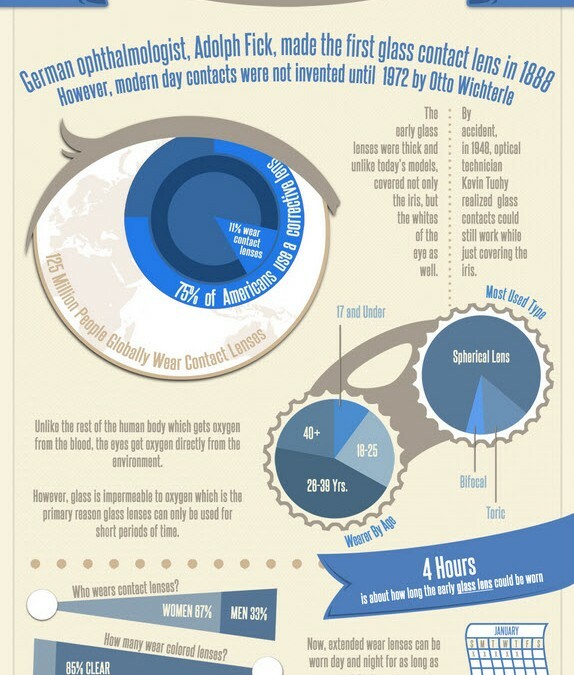 When I came across this infographic , I had forgotten that the first contact lens made were glass and made by a glass blower! They were painful to wear and could not be worn for long. In fact August Muller had to use cocaine to desensitise his eyes and even then he could only wear them for half an hour. From this glass blower in 1887, came the opthalmologist Fick in 1888 and the rest they say is history. Contact lenses have come a long way and with experienced advice from and careful fitting by a Optometrist, they are comfortable and convenient . Great for most sports, socialising or just going for a different look. Something I remember well was the initial popularity of coloured contact lenses in the 80’s. then you could turn brown eyes blue. If you want more information about these lenses or a free trial call us anytime.